The pterygopalatine fossa is a pyramidal space between the pterygoid process of sphenoid behind and the perpendicular plate of palatine in front, situated deeply below the apex of the orbit. The rear of maxilla replaces the palatine bone as the anterior boundary of the entry of the fossa- the pterygomaxillary fissure more laterally. Anterior: Perpendicular plate of the palatine and posterior surface of the maxilla (superomedial part). Posterior: Pterygoid process and adjoining part of the anterior surface of the higher wing of the sphenoid. Medial: Upper part of the perpendicular plate of palatineorbital and sphenoidal process of the palatine. Lateral: The fossa opens into the temple fossathrough pterygomaxillary fissure. Superior: Under surface of the body of the sphenoid and orbital process of the palatine. The lateral part of the roof is open and here fossa opens into the orbit via inferior orbital fissure. 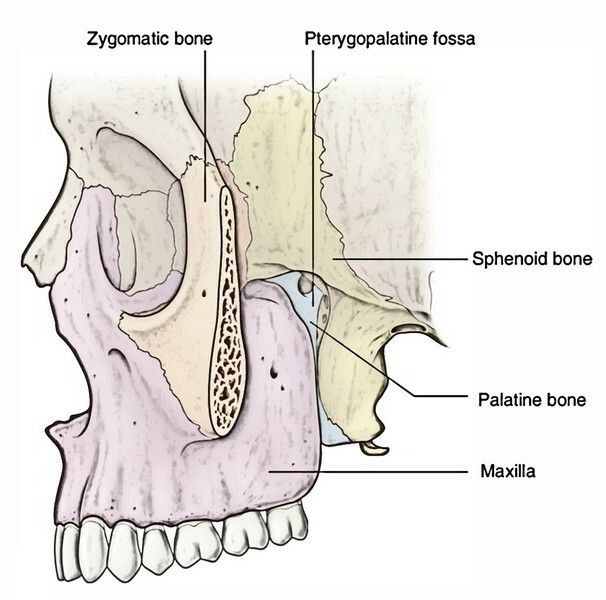 Inferior: Pyramidal process of the palatine bone in the angle between the maxilla and the pterygoid process. Anteriorly: With the orbit via the medial end of the inferior orbital fissure. With the middle cranial fossa via foramen rotundum. With the foramen lacerum via the pterygoid canal. With the pharynx via palatovaginal canal. Medially: With the nose via sphenopalatine foramen. Laterally: With the infratemporal fossa throughpterygomaxillary fissure. Inferiorly: With the oral cavity via lesser and greater palatine ducts. Third part of the maxillary artery. The maxillary nerve, the next section (V2) of the trigeminal nerve is only sensory. It appears from the convex anterior border of the trigeminal ganglion, pierces the trigeminal cavern of dura to reach the lower part of the lateral wall of the cavernous sinus. The nerve leaves the middle cranial fossa via foramen rotundum to get to the pterygopalatine fossa. It traverses straight in the upper part of the fossa and enters the orbit via inferior orbital fissure, therefore it is named infraorbital nerve. The infraorbital nerve (in fact a continuance of maxillary nerve) runs forward along the floor of the orbit in the infraorbital groove and canal in series and appears on the face, via infraorbital foramen. Thus in its course the maxillary nerve traverses 4 regions in sequence: the middle cranial fossa, the pterygopalatine fossa, the orbit and the face. In the pterygopalatine fossa the pterygopalatine ganglion is suspended from the maxillary nerve by 2 roots. Meningeal branch: supplied the dura mater of the middle cranial fossa. Ganglionic (communication) branches: two in number to pterygopalatine ganglion. Posterior superior alveolar nerve enters the 1 or twoforamina on the posterior outermost layer of the body of maxilla and supplies the mucus membrane of the maxillary air sinus. Afterward it breaks up to create superior dental plexus, which supplies the molar teeth and adjoining part of the gingiva. Middle superior alveolar nerve enters downward and forward along the lateral wall of the maxillary sinus, joins superior dental plexus and supplies the premolar teeth. The dental branches join the superior dental plexus and supply the canine and incisor teeth. The nasal branches appear in the lateral wall of the inferior meatus and supply the mucus membrane of the lateral wall and floor of the nasal cavity. Palpebral branches turn upwards and supply the skin of the lower eyelid. Nasal branches supply the skin of the side of nose and the mobile part of the nasal septum. Superior labial branches supply the skin and mucus membrane of the upper lip. The superior dental plexus is composed by posterior, middle and anterior superior alveolar nerves. It’s situated in the alveolar process of the maxilla above the sockets of the teeth. In the pterygopalatine fossa Ganglionic branches. In the infraorbital canal 1. Middle superior alveolar nerve. 2. Anterior superior alveolar nerve. On the face Palpebral branch. 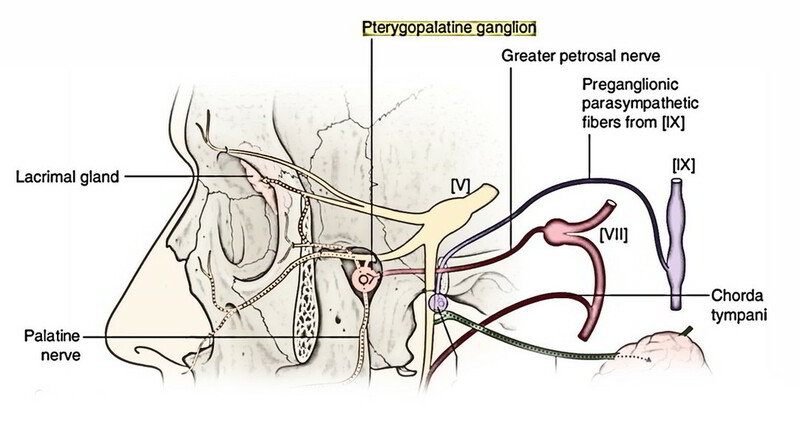 The pterygopalatine ganglion (ganglion of hay fever) is the largest parasympathetic peripheral ganglion. It acts as a relay station for the secretomotor fibres to the lacrimal gland and mucus glands of the nose, palate, pharynx and paranasal sinuses. Topographically, it’s related to the maxillary nerve, but functionally it’s joined to the facial nerve via greater petrosal nerve. Location: It’s situated deeply in the upper part of the pterygopalatine fossa, suspended from maxillary nerve by 2 short roots. Size: Head of a small pin. In front: Perpendicular plate of palatine. Motor or parasympathetic root: It’s originated from the nerve of pterygoid canal. It carries preganglionic parasympathetic fibres from superior salivatory nucleus (situated in the lower part of the pons). These fibres relay in the ganglion. The postganglionic fibres originate from the cells in the ganglion and supply secretomotor fibres to the lacrimal gland, glands of the nose, palate, nasopharynx and paranasal sinuses. Sympathetic root: It’s originated from sympathetic plexus around internal carotid artery via nerve of pterygoid canal. It includes postganglionic fibres from superior cervical sympathetic ganglion. These fibres go through the ganglion without relay and offer vasoMotor Supply to the mucus membrane of the nose, palate, pharynx and paranasal air sinuses. Sensory root: It’s originated from maxillary nerve and goes through the ganglion without gap to be dispersed via the branches of the ganglion. The branches of the ganglion are truly the branches of maxillary nerve, which goes through the ganglion without relaying. While going through the ganglion, they integrate the parasympathetic and sympathetic fibres of the ganglion. The palatine branches contain lesser and greater palatine nerves. 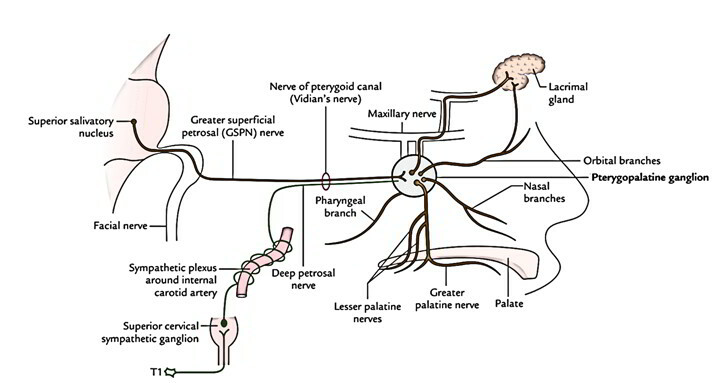 The greater palatine nerve goes through greater palatine canal and foramen to supply posteroinferior quadrant of the lateral wall of the nose. The lesser palatine nerves go through lesser palatine ducts and foramina to supply secretomotor fibres to mucus membrane and glands on the inferior surface of soft palate and hard palate. The nasal branches go through sphenopalatine foramen to goes into the nasal cavity. All these are referred to as posterior superior nasal nerves. All these are split into 2 sets medial and lateral. The nerves of lateral set supply lateral wall of the nasal cavity while those of medial set supply roof and nasal septum. The longest branch of medial set is named nasopalatine/ sphenopalatine nerve. It runs anteroinferiorly in a groove on the nasal septum and leaves the nasal cavity via the incisive foramen to goes into the oral cavity where it supplies the anterior part of hard palate. The pharyngeal branch goes through palatovaginal canal and supplies the nasopharynx. The sensitive circumstances, viz. hay fever or cold, cause aggravation of nerve of pterygoid canal/pterygopalatine ganglion, which causes blockage of glands of the nose and palate and lacrimal gland Thus the individual suffers from running nose and eyes, for this reason the nerve of pterygoid canal is termed nerve of hay fever and the pterygopalatine ganglion is called ganglion of hay fever. The third part of the maxillary artery enters the pterygo-palatine fossa by passing first between the upper and lower heads of lateral pterygoid and after that via the pterygomaxillary fissure. Inside the fossa it is located in front of the pterygopalatine ganglion and breaks up into its terminal branches.